I took one creative writing class in college. It was a round table workshop sort of thing where you had to share your writing and brave the critique – terrifying and toughening, all at the same time. I wish I’d taken more. I wish I’d pursued a creative writing degree. To a point. Not so scared that I can’t go up in high rise buildings but enough that there’s no way I’d cross one of those hanging foot bridges. Yes. (And no, I couldn’t always say that.) I don’t really consider myself a chef, though. I feel like a chef is half artist, half cook and I don’t have that sort of skill. I’m great at following recipes, though! So we remodeled our bathroom last year. We took out the tub and put in a huge honking shower (that’s the official design term, “huge honking shower”) because it just made more sense. I love it. This morning I had the dogs in there for their baths (should we call them showers now?) – I’d just finished up the second one and sent her out for paw drying then set to cleaning up. I picked up the handheld attachment I’d been using and was looking at it as I turned on the water and sprayed myself full on in the face. I was so surprised that I busted out laughing. Clearly, coffee before dog showers next time. Yay! 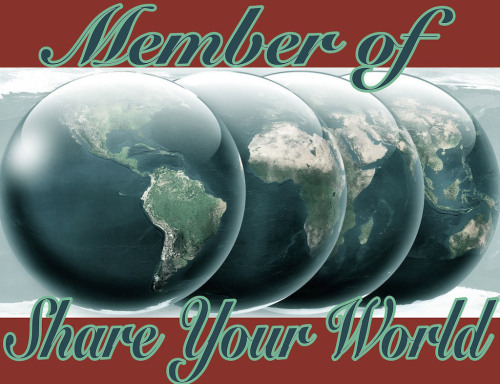 Cee’s Share Your World is back! Click on over and check out her blog. Next Next post: Code Red! Gracie won’t move for a treat. I have never tried any of those high foot bridges and i believe i would never do. Let’s watch others do it on youtube maybe one day we can cross any or just take a picture! Thanks for sharing and it’s nice to know about you. They’re definitely a hard no for me. Not everything has to be experienced firsthand, right? 😊 Thanks for reading! I think I’m going to participate in this share your world thing too. It sounds so cool. As for a class I wish I’d taken – there are a couple dozen. I love creative writing too but never thought I was good enough at it to pursue a degree in it (at least, not once I was old enough to know about college and such). You should definitely give Share Your World a try. Cee usually posts her questions sometime on Monday mornings — It’s a lot of fun! Definitely you need our coffee first. 😀 😀 I did take a couple creative writing college courses, they were fun. In fact that is the only official college courses I ever took.